My wife and I decided on an impromptu walk last night, just before dusk. 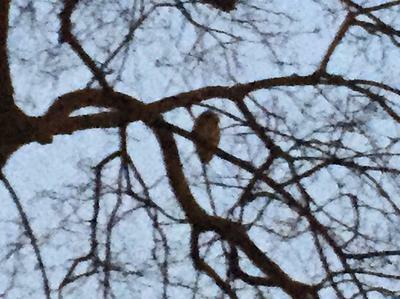 On the return trip, walking down Victoria Avenue between Tecumseh and Giles streets, I heard what I thought was an Owl call and we stopped to look around. We heard the call again, with one or possibly two answers coming in from not too far away. 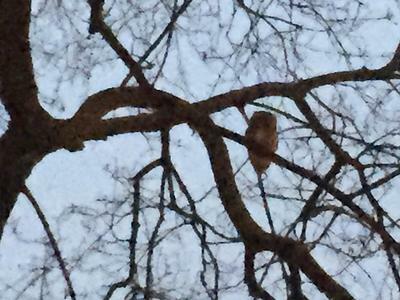 Then I spotted the Owl in a tangle of branches up in a bare tree. It wasn't big - though I think it was maybe twice the size of a pigeon - it could have been bigger given the distance. The call sounds a lot like the Eastern Screech Owl's "trill", but I couldn't upload the video here. Needless to say the sighting really made our evening. That's cool! Was this in Ontario?